I’ll keep this brief, since the name really says it all. We don’t often have mashed potatoes, but when we do, they tend to have great things added to them. Sometimes it’s fresh or roasted garlic, other times it’s sauteed onions or lots of chopped herbs. This quickie recipe will help sustain you through the end of the week, and hopefully inspire you to have a delicious potato side dish of your own. Try this combination, it’s a winner. Cut the potatoes into eighths and boil in salted water for 10 minutes or until they are very tender. While they cook, cut up the spring onions and set aside. Drain the potatoes in a colander and immediately put the hot, empty pot back on the stove. Add butter and chevre, which will begin to melt almost immediately. Add the hot, drained potatoes back to the pot. Remove from the heat and mash until coarsely mashed (not whipped), Stir in the chopped scallions. Taste for seasoning. Depending on how salty your chevre is, you may or may not want to add salt. Add pepper to taste. Serve up hot along with almost anything. * Enjoy! 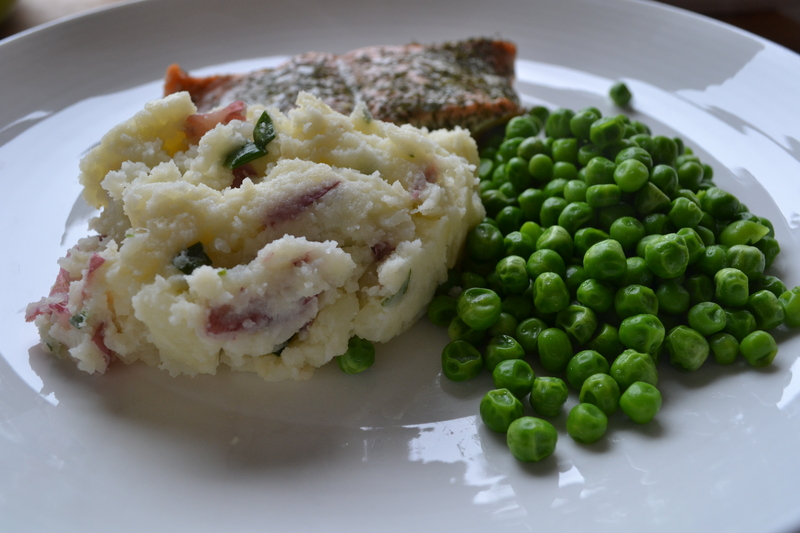 * We had these with steamed green peas and salmon. No complaints.